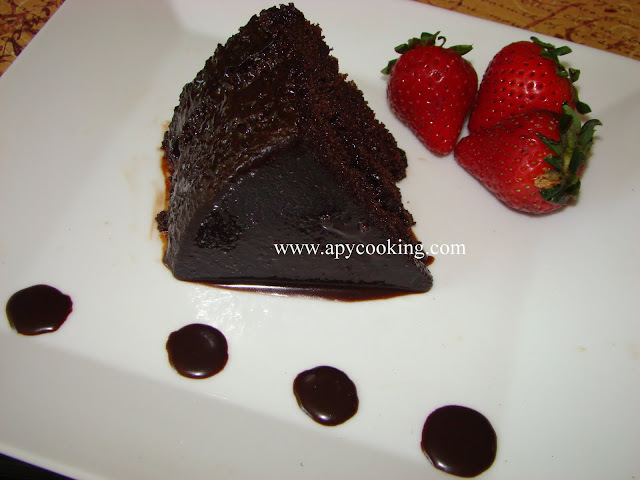 So you always wanted to bake a cake, but do not have a convection oven. You do have a microwave oven but you never thought of making a cake in it. Wait. Look at this cake. Soft, spongy and super-easy to make. Take a deep breath. And get started. 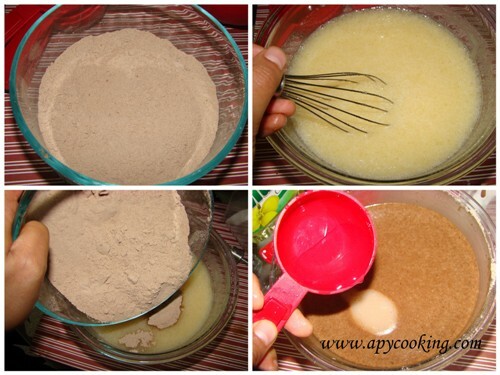 In a small bowl, add all purpose flour, cocoa powder and baking soda and mix well. [Make sure the flour and cocoa powder do not have lumps. If they do, then using a large sieve, sift them first]. In a large bowl, with a manual whisk or large fork, mix oil, sugar and vanilla. Add milk and whisk thoroughly into a smooth solution [get rid of all the lumps. Scrape the sides as well]. To this, add the flour mixture little by little whisking as you add. Add water and mix thoroughly (scraping the sides) for 10 to 15 seconds to form a smooth cake batter. Grease the insides of a large microwave safe round bowl with oil or cooking spray liberally. Pour the cake batter into the bowl. The cake batter should fill half (or less than half) of the bowl. Otherwise it will spill out. Microwave for 6 to 7 minutes in regular microwave mode (NOT convection mode). You will see moist spots in the center and sides of the cake. No worries. Switch the microwave off and let the cake remain untouched for another 10 to 15 minutes. This is the standing time where the cake will continue to cook even after you turn the microwave off, with the heat generated within it. [If you wait for the cake to cook completely before you turn the microwave off, the cake will continue to cook during the standing time and will become rubbery]. If you plan to invert the cake, allow to cool for another 20 to 25 minutes. [The bottom of the bowl should not be hot.] Then place a large plate or cake board on top of the cake bowl. Turn the bowl upside down and tap the bottom (which is now on top). The cake will slowly slide onto your cake board/ plate. Remove the bowl carefully. You will not get beautiful neat sides like oven baked cakes. You can cover this up with a chocolate glaze. A quicker solution would be to frost the cake with Nutella like I have done here. In a saucepan or microwave, melt 2oz (57g) chopped baking chocolate (or chocolate chips) with 1 tbsp milk. Remove, mix well and add 4 tbsp sugar, 1 tbsp water and 3/4 tsp vanilla essence. Mix well. [Amount of sugar depends on whether you use semi-sweet or milk chocolate (I used semi-sweet), so adjust accordingly. Add more water if you prefer a thinner glaze.]. [I actually used 3 oz chocolate, which gave me too much glaze, so I scaled down the proportion in the recipe. Feel free to adjust your glaze the way you like it]. Cool. Pour the glaze on top of the cake and watch it as it slides down the sides and oozes onto the bottom. Refrigerate the cake for an hour or two to let the glaze set. So what did I do with the extra glaze? See for yourself. Go ahead, give it a try. Who knows, for the next birthday in your family, your cake may be sitting at the centre-table! Check my Eggless Microwave Coffee Cake. ok, this is something, I have to try, firstly it looks divine, then it is eggless and thirdly, microwave, are you kidding? I am making it over the weekend. I would like to know one thing though, how many slices (the slice size that you showed in the first pic) would these measurements yield? wow very tempting cake !! perfectly baked and looks so yummy !! Priya, this will easily yield six to seven huge slices. I used a Pyrex 1.65L bowl. Sounds like fun, Priya. I will be able to join only in July, will be busy fr the next two months. Will let you know. I'm not sure how doubling the recipe will work, you may need a really huge microwave safe dish, otherwise the batter will spill all over. You should probably do them in two batches. Enjoy the potluck. Yr guests will be feasted to some pretty neat dishes, I'm sure! like the idea of baking 2 cakes instead of 1 or taking a real large bowl. Let me see how it works out and I will let you know. That is a wonderful presentation.. Love the easy cake ! Oh my! That is one gorgeous cake! I love how you can bake or in this instance microwave a cake in 7 minutes!! I am making this one for sure when I need me a chocolate fix! wow !! 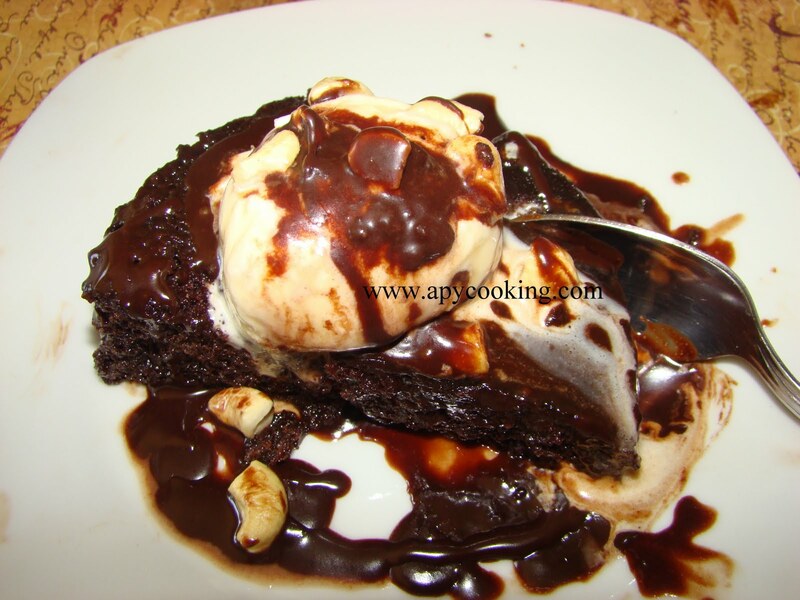 absolute divine...luved the chocolate glaze ...simply gorgeous..bookmarking !! Cake looks absolutely marvellous, lovely texture and delicious..
Oh God your first click is yelling me to try it right now. Divine !!! I'm drooling! Delicious and incredibly easy to make!!! This is really a great cake. Will surely try. The steps are very good and well explained. Have been itching to make a cake in micro for long, but hardly got any time. BTW, I love ur glaze. Cake looks decadent. Varsha, after 7 mts, switch microwave off. But dont touch the cake for another 15 mts. Oh my that looks heavenly, so moist and soft! i tried this cake for my hubby, who normally don't prefer chocolate cakes. but i am surprised that not only he liked it but asked for a second serving. thank you so much. Hi Aparna, not having a OTG oven never stopped me from baking cakes. They just don't brown well. This seems perfect and well definitely be trying it out soon ! Glazing looks so perfect..
Is baking powder and baking soda different? Yes, they are different. I haven't tried this with baking powder. Once you switch the microwave off, let the cake remain in the microwave for another 15 mts. After that you can take it out and leave untouched for another 20 to 25 mts. I tried this and it was really a good one. Very quick and eveyone enjoyed it. i tried it with butter instead of oil and it came out really good ! Hi dear... I wanna make this.. I ve tried chocolate cakes eggless, one from your blog and one form another. And this one looks too tempting to make anyone s day happy:-) My question is, is chocolate glaze material available in India? Thanks. I believe you get baking (cooking) chocolate in India. You could try melting regular chocolate in a double boiler or you could use alternatives like Nutella or any chocolate spread. I have everything for this except Baking Chocolate. Any great substitution ideas? I have semi-sweet chips and chunks, and regular cocoa powder and dutch processed cocoa powder. :) Thanks! This looks fun and yummy! 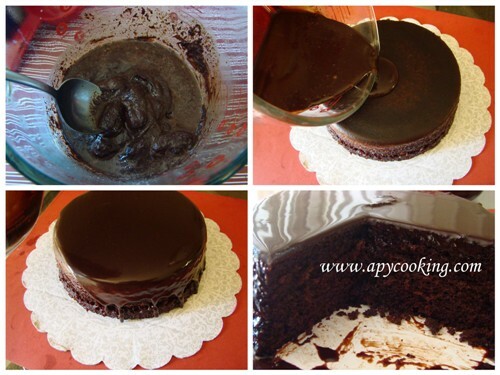 Use regular cocoa powder to make the cake. For the glaze you can use semi-sweet chocolate chips or chunks. wanna try this out for my hubby's b'day. just one question. how much exactly would 1 cup be in gms or oz as per your recipe. plz help me as i am a novice when it comes to using the microwave as well as baking. your recipe sounds really simple and the clicks are amazing. wish i could make such a fabulous looking cake. thanks for sharing this cool recipe. Hi, not sure exactly how much 1 cup weighs in grams. I used a standard measuring cup - you get it now in many departmental stores. Thanks for your wonderful comment. Happy Cooking! I tried this choco cake for my niece's birthday. 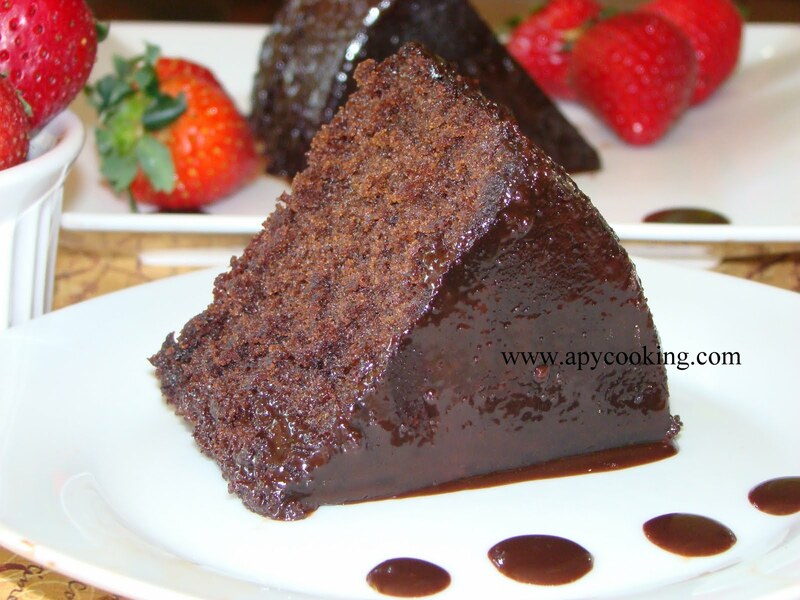 I was a little apprehensive to try a microwave cake.. but it turned awesome.. very moist.. Thanks Aparna -:) All were asking for the recipe. You have a few more fans now..
Hi, im actually gonna bake a cake for the first time so i wanted to know at what temp it should be cooked ? I mean medium or high ? Jenny, I used the highest microwave setting. 900W or 1000W shud be fine. Thank you so VERY much for such a GREAT recipe! Has anyone made a vanilla or white cake like this? Can we use chocolates like 5-Star or Dairy milk for the icing? One more thing...I baked the cake for 6.30 mins...but its top got a little hard....should i try reducing the time to 6 mins. I dont know if ill be able to manage the temp? Thanks for tyring. If the top has gotten hard, reduce the time next time. 6 minutes shud be fine. I guess you could use dairy milk, but melt it in the saucepan. Yesterday i prepared chocolate cake it came very nice.Thank you so VERY much for such a GREAT recipe! Great to hear that :). My name is Aparna. Hi Aparna - I made this cake for my cousin's birthday and he loved it. It was so soft and moist and had so much of flavor, that I didn't need to add any frosting or glaze. Thank you! Cool!!! Wish your cousin a Happy B'day from me! Hi Aparna, I tried this cake for my daughter today. It came out well but could have been a little soft.I dont know where i went wrong. This is my first attempt at cake. Family was very happy and said that its not bad for first try. So thanks a lot for the recipe. Just reduce the time by 30s next time. 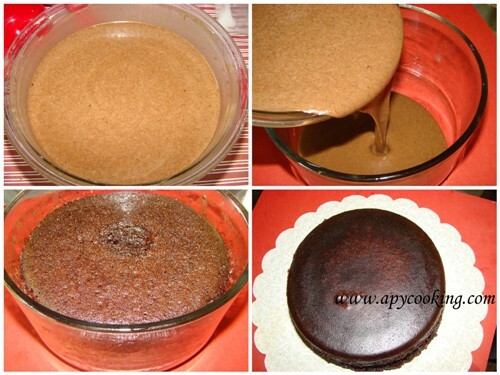 i have tried this cake 2 times and its taste was nice but when i take out my cake from the container ....its texture is good ,.....it doesnot have a smooth surface as like your cake,s upper surface................Even tell me you are using pure cocoa powder in your cake or its drinking chocolate powder!.......plz help! Maybe you should grease it a little more. And once the cake is cooked, give it some more time before you remove it.